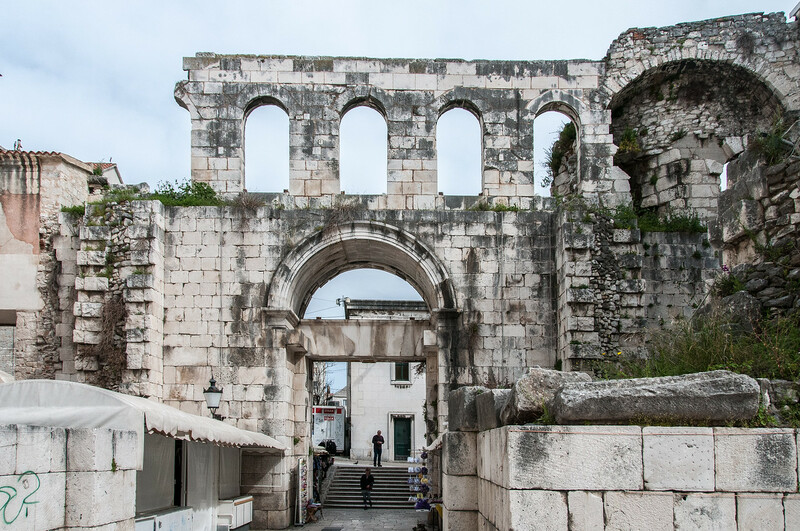 The importance of Diocletian’s Palace far transcends local significance because of its level of preservation and the buildings of succeeding historical periods, starting in the Roman period, which form the very tissue of old Split. The palace is one of the most famous and integral architectural and cultural buildings on the Croatian Adriatic coast. 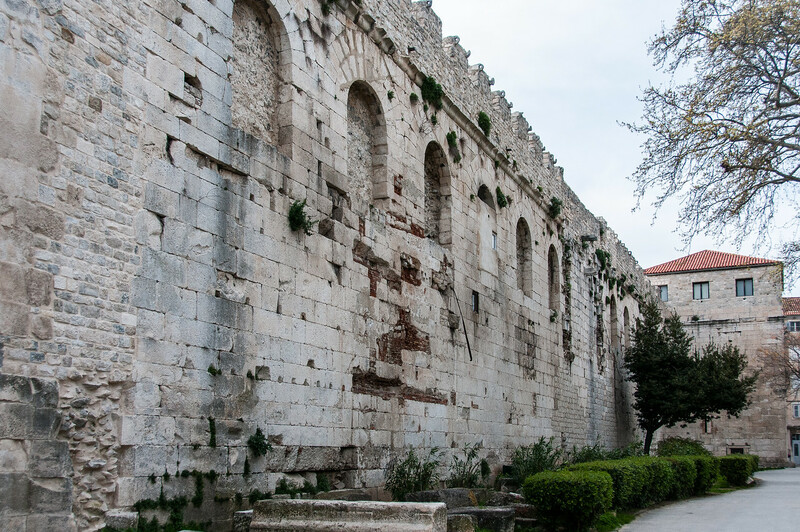 The ruins of Diocletian’s Palace, built between the late 3rd and the early 4th centuries AD, can be found throughout the city. The Roman Emperor Diocletian spent his declining years in an enormous palace that he had built near his birthplace, Aspalthos, in Dalmatia. The palace represents the most valuable example of Roman architecture on the eastern coast of the Adriatic. Its form and the arrangement of the buildings within the palace represent a transitional style of imperial villa, Hellenistic town and Roman camp. On the eastern side of the palace lies the Porta Argentea (Silver Gate) with the church of St Dominic on the opposite side, it was reconstructed between 1932 and 1934. The Silver Gate gives access to the Plain of King Tomislav and thence to the Peristil (peristyle), the central open-air area of the palace. Its longitudinal sides are surrounded by an arched colonnade; the arches in the west are closed by Gothic and Renaissance houses. monumental port with four columns carrying a gable closes the Peristyle in the south. The Mausoleum of Diocletian (today’s Cathedral of St Doimus dedicated to St Mary) lies in the eastern part of the peristyle. The mausoleum has almost completely preserved its original octagonal form, encircled by 24 columns which supported the roof; the interior is round, with two rows of Corinthian columns and a frieze. A dome, once covered with mosaics, roofs the mausoleum. The monumental wooden gateposts and the stone pulpit from the 13th century represent the oldest monuments in the cathedral. The choir, constructed in the 18th century, is furnished with Romanesque seating from the 13th century and ornamented with a painting representing the Mother of God with the saints and donors. The palace of Diocletian is a very interesting site and unlike anything, I’ve really seen before. I’ve been visited many palaces and Roman ruins before, but what I found in Split was totally different. The entire palace has been taken over by the city. By that, I don’t mean the city was built on top of the ruins of the palace, as you might see in many other places, but rather it was built inside the palace. You can literally see homes and businesses with original standing pillars embedded in their walls. 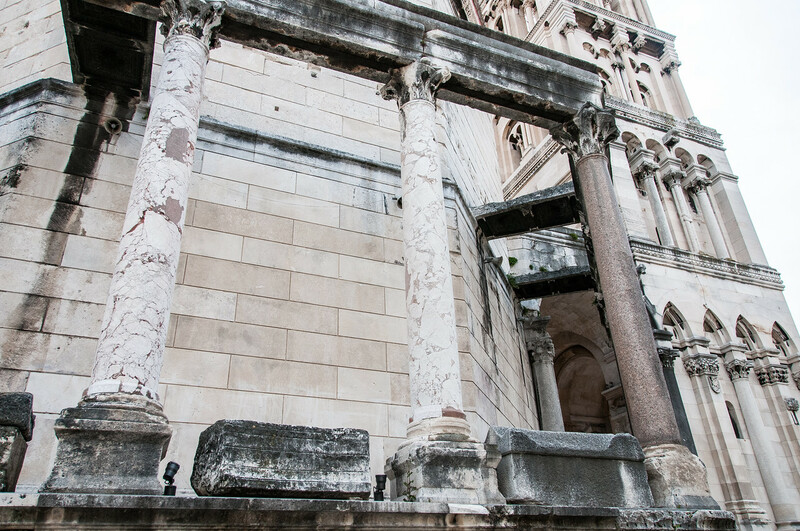 The cathedral of Split is the mausoleum of Diocletian. (which is really ironic considering that Diocletian was responsible for one of the greatest persecution of Christians in history.) As it was never intended to be a church, it is also one of the smallest functioning cathedrals in the world. The palace is located in the heart of Split and should be a part of any visit to the Dalmatian coast of Croatia. The Historical Complex of Split with the Palace of Diocletian is a cultural UNESCO World Heritage Site in Croatia inscribed in 1979. It is recognized as both an urban and archaeological monument in Croatia. This site comprises structures and buildings that were used mostly during the times of the Romans in Croatia. In fact, the history of the site dates back to the 3rd century AD. It was during this time when Roman Emperor Diocletian built his palace in Split. He spent the rest of the years of his life living in this palace after he abdicated it in 305. Today, the Historical Complex of Split with the Palace of Diocletian forms half of the town of Split. 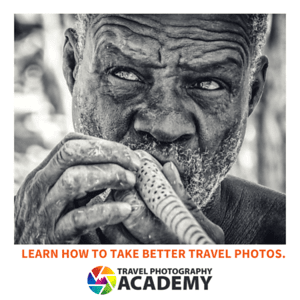 It is also commonly referred to as “the palace” among locals and tourists alike. It is also a popular tourist destination among the visitors to Split. 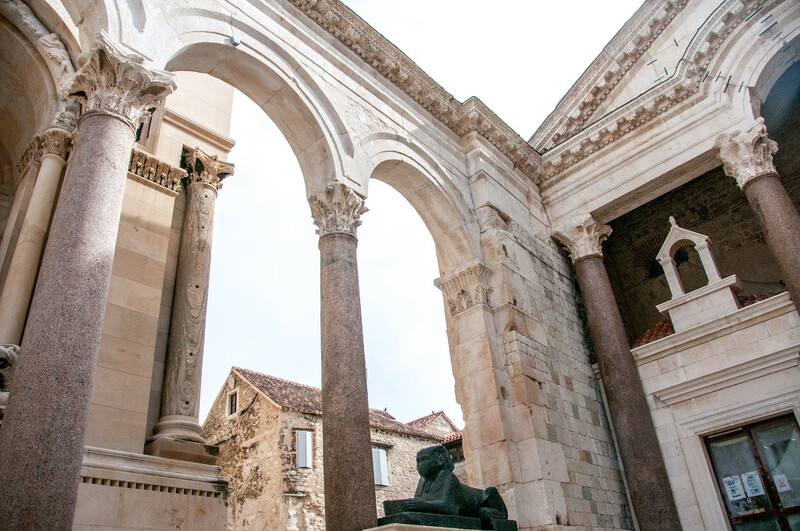 The Historical Complex of Split with the Palace of Diocletian is at the heart of a city’s remarkable history. 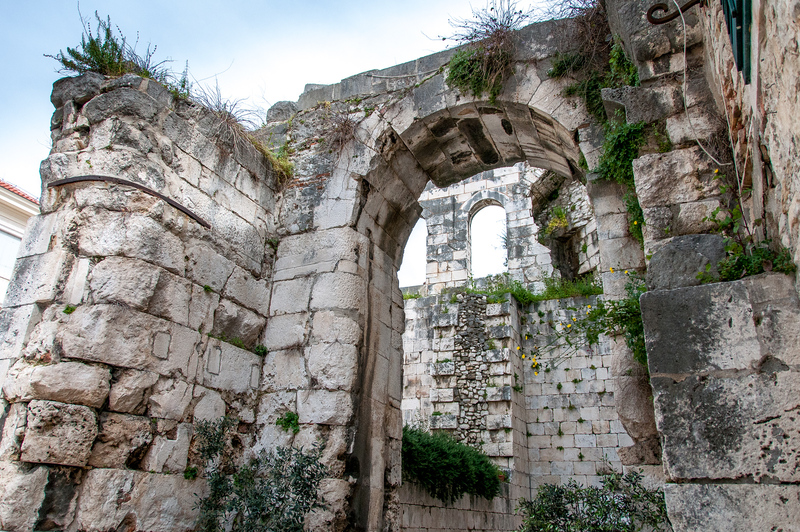 Since it was named a World Heritage Site in 1979, it has been under the protection of UNESCO in an effort to preserve the historical and cultural heritage of the city of Split. Split is considered as the unofficial capital of Dalmatia. Despite its beautiful townscape, it has had a turbulent history. This history and the structures that were formed for several centuries are one of the highlights that attracted millions of visitors. However, the Diocletian’s Palace is the heart of this city and the main feature of this UNESCO site. As mentioned earlier, the Historical Complex of Split with the Palace of Diocletian features the ancient palace at the heart of it. This ancient palace was built in the 4th century AD by the Roman Emperor Diocletian. This palace covered a total land area of about 30,000 square meters. It featured a rectangular plan and is surrounded by thick, towering walls. In fact, it covers about half of the old town of Split. Even though it is commonly referred to as the “palace” and was used by the Emperor as the retirement residence, it is actually more of a fortress. About half of the palace is used for personal purposes while the other half served as a military garrison. When the Romans abandoned the palace, it sat empty for several centuries. During the 7th century, the abandoned palace became the refuge for the residents that fled the invading Croats. Since then, the residents continued to flock to the area near and within the palace itself. They have built homes and businesses in the region. In fact, you will still find some of these homes, shops, and other structures near the palace and within its walls. It remains as historically one of the most important buildings in Split. It is also a dominant architectural and cultural feature along the Adriatic Coast. In fact, it is the most complete remain from a Roman palace anywhere in the world. View my complete list of UNESCO World Heritage Sites in Croatia. Disneyland, California – Fun for Kids, but What About Adults? This is my kind of destination. I love structures and ruins with historical significance and it makes me really happy when I get the chance to visit one of those places. Did you rub the big toe of the statue? Are you thinking of Nin, which is near Zadar? See, kids? It’s not just Dubrovnik that’s cool! Pretty much the entire coast of Croatia will have you reaching for your camera every 2 seconds. Have fun! Split was a delightful surprise as it was sort of a stop on my way to Dubrovnik but I found it to be most delightful and full of surprises. I cannot wait to go back!